While in Buffalo, NY for Buffa10, I posted a little piece on water features and received an email from one of many of Buffalo’s excellent gardeners, inviting me to see his garden and water feature, which was located across the street from our hotel. “I have a garden “Hope Blooms” at The Victorian which has been on Garden Walk Buffalo for six or seven years and featured in A&U (Arts & Understanding) Magazine. 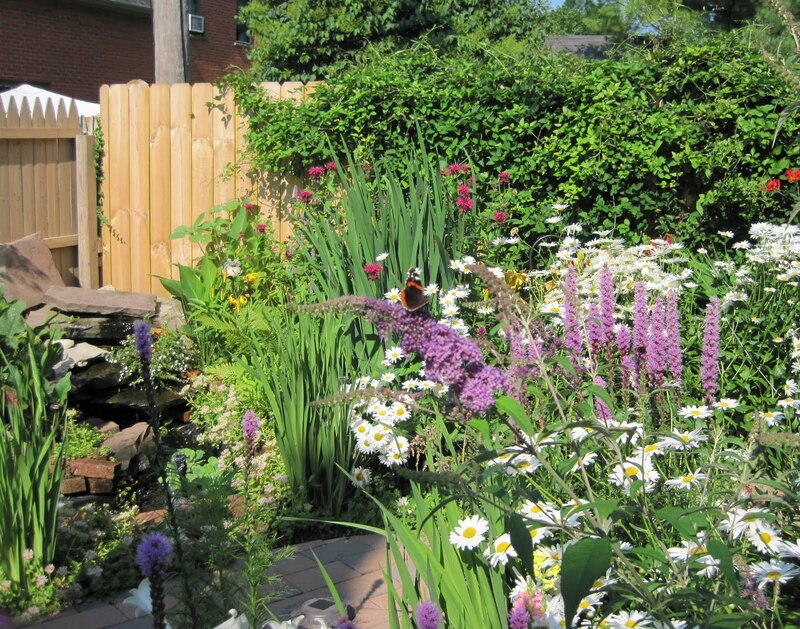 It is also one of the featured Open Gardens for the First Annual National Garden Festival. 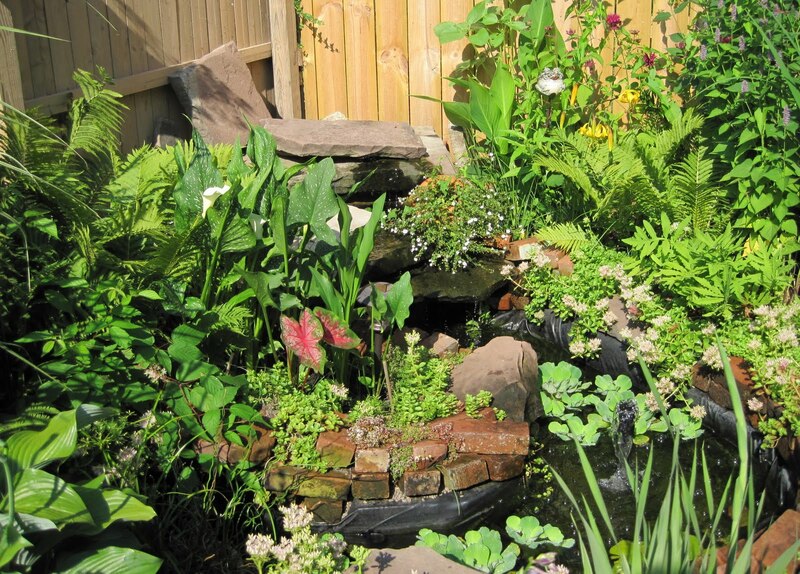 I built an interesting water feature in this backyard garden – a small pond and waterfall - from old bricks and stone we salvaged during the renovation of this 1854 home. It is humble but, I think at least, fitting for the setting. The garden is called Hope Blooms as it is a garden by and for those living with HIV/AIDS – as opposed to a memorial garden. If you are staying at the Embassy Suites in the Avant, the garden is almost right across the street at 200 South Elmwood Avenue behind what we call “The Victorian”. “We” are AIDS Community Services of WNY, and my real job is Director of Marketing and Special Projects for the agency. On Sunday morning, I walked over to the garden with Dee of Red Dirt Ramblings and Gail of Clay and Limestone and met Chris, sitting by the entrance to the garden, reading the paper. He warmly welcomed us and gave us a grand tour of the garden and a peek inside The Victorian. And some garden gloves and string hanging on a window grate. With some tools on the window ledge below. Chris laughed when we pointed them out and said that some people told him he should put those away when the garden is on tour. But I liked them there. 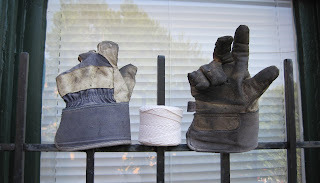 Seeing them brought back memories of how my Dad also kept a trowel, his pruners, and maybe some string on the window ledge above the hose spigot, within easy reach anytime he was outside. Maybe I’ll do the same in my garden - keep a few tools on the window ledge - to remind me of the garden I grew up in, and now Hope Blooms, one of many beautiful gardens in Buffalo, New York. What a beautiful water feature! And I like the name- 'Hope Blooms'. There's always the wheelbarrow and spade out in my garden. Probably too lazy to put it away each time I use it. But it reminds me that it's a work in progress. Carol - it was one of my favorites, too, and I loved the sign hanging there. I was so amazed by the Crocosimia in that garden. We went to see the garden, but didn't know the story, so thanks for sharing that - makes the memories even more special. I like that idea, too... partly because it makes me want to steal it. You know, so I can actually FIND these things when I need them! So, Carol... no photos yet of the weeders that you bought while you were in Buffalo? Boo--I like to "buy vicariously" through my friends! lol. Thank You so much for visiting our garden! It was such a pleasure meeting the three of you. Look me up next time you're in the area! 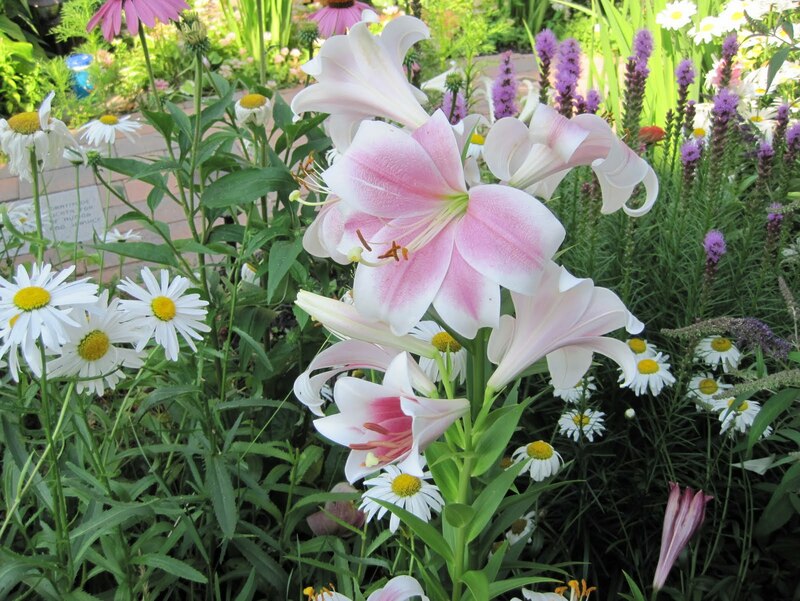 I was quite taken aback when Hope Blooms was asked to be an open garden and I have been humbled by the comments I have received by a number of our guests...particularly a group so knowledgeable as the garden bloggers. I just brought fresh bouquets in to the clients this morning and got many compliments and thank you's from our clients and patients. So simple a task...so great a reward. I'm so sad I didn't see (or even hear about) that garden. It looks very special. I'm kicking myself for missing this garden. How uplifting it must be for the clients, and for Chris. The gloves on the fence are great. I like the glove idea too. I think I have just the place! We walked over to see it before dinner on Saturday. What an exquisite spot in the middle of the large buildings. Serene and contemplative, perfect for those who need a lift. Beautiful post. And there IS something therapeutic about fresh flowers. Must be the breath of life and energy that they bring with them. I like that water feature only I have to say I could have used another couple of views of it to get the whole impact. 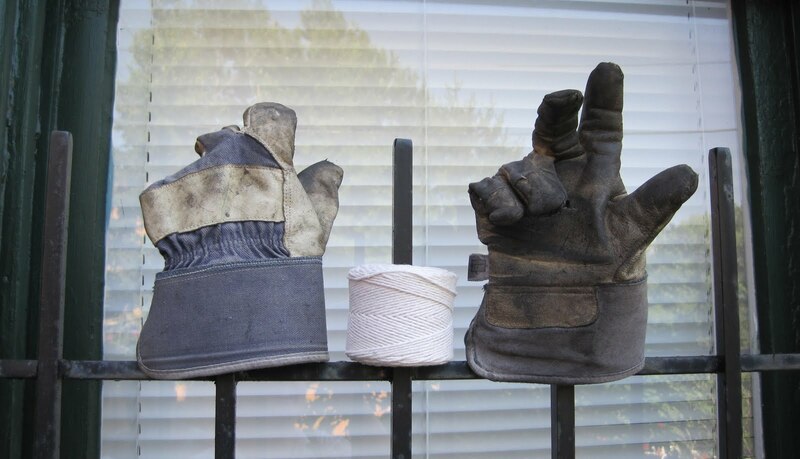 My favorite image in this post is the gloves and twine. What a delight. I am glad you shared it with us. Thanks, Carol...there's something about the used bricks and scale of the water feature and the practicality of gloves and twine kept ready-to-hand that make this a very human garden and a very honest one. How very cool that you got to see it! I went looking for this garden, but my directions were not as precise as yours. It looks beautiful. And hopeful. What a lovely place! Gardens like these are extra special because of the comfort and joy they provide to others. Glad the three of you were able to see it and meet the gardener. I too" like the Gloves it's a fun whimsical unique idea and the Water feature.. too' cute..
Bloom Day at mid-year. There's already a bit of autumn in the air. Sigh. I'm so sorry I missed seeing this garden. I can tell from your pictures I would have loved the garden. I'm even more impressed by the cause it serves and the hope it brings.